He didn't want to do this. He didn't want to hurt anybody. He had no choice in what he was doing. The yellow Meerca clearly remembered the beginning of the Faerie Festival. He was so excited to see all the faeries having fun. He wanted to take part in it himself. The Meerca wasn't able to travel to Faerieland for the event. It was a shame, too. He wanted to have fun with all of the Neopets, he wanted to see the faeries, he wanted to take part in all the fun activities. That was all the Meerca wanted to do. "Do you want to go to the Faerie Festival?" That offer. The Meerca shouldn't have taken the offer, especially from somebody as shady as that being was. Deep down, the Meerca knew it was a bad idea to go along with it. Still, he had always wanted to visit Faerieland. He wanted to meet Kaia and Fyora and Taelia and all the other faeries. 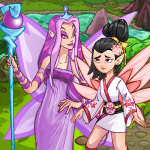 What better time to do that than the Faerie Festival? So he took the offer. That decision would haunt him for the rest of his life. There were more Neopets the figure said was coming along to the Faerie Festival. The Meerca didn't know any of the Neopets. However, they all looked like nice Neopets. As the group traveled, the Meerca began to talk to a blue Jetsam. That Jetsam was an interesting Neopet. Then the being asked for everybody's attention. And that was when things started going south. The being began chanting something that nobody understood. A beam of bright pink light shot towards the Jetsam. Once the light hit the Jetsam, some dark purple energy began to envelop him. All of the other Neopets panicked and began to flee. They ran as fast as possible. The Meerca felt getting hit by that beam of light. He felt the purple energy swirling around, slowly consuming him. It felt cold and hot at the same time. It hurt. The Meerca wanted to run, but he was frozen in place. When everything stopped, the Meerca looked at himself. His hands were no longer yellow, but purple and made of that energy that had once been spiraling around him and the other Neopets. He looked down at his feet. They were not there anymore; they were replaced with a puddle of energy. His tail had turned into a pink mist that floated around him. He was a wraith now. What just happened to him? What just happened to the other Neopets? How did this even happen? To the Meerca's knowledge, there was no way Neopets could turn into wraiths like this! He was scared, he didn't know what to do. He wanted to run, but he was frozen in place. The Meerca didn't know if he was frozen because of the the magic that had been placed on him or just out of fear. It didn't matter in the end. He just wanted to get away as fast as he could. But the Meerca also felt... like he wanted to stay. Darker and more malicious thoughts seeped into the Meerca's mind, mingling with his fear. The Meerca was scared, but he couldn't help but feel mischievous as well. Not only did the Meerca turn into a wraith on the outside, but now he was starting to feel the mentality of being a wraith. He wanted to cause harm, he wanted to fight the faeries, he wanted to terrorize Neopets and feed off that fear. It was terrifying. "Now, let's head to the festival." The being's voice was as cold as ice when he said that. The Meerca wanted to run away, but he followed the being to the Faerie Festival. The Meerca fought and fought and fought, but he couldn't control his own movement anymore. The most that the Meerca could do was to look at the other Neopets that had come along. They were all wraiths, too. The Meerca could feel that they were all terrified, just like him. The being led the Neopets to the top of a hill overlooking the festival. Cheery music was playing. Some faeries were playing instruments. Neopets were gleefully dancing and enjoying themselves. He could even see Kaia and Fyora. It was everything the Meerca had imagined it to be. Destroy? What could that mean? the Meerca thought to himself. His own questions were answered when he and the other wraiths began to move towards the festival. Each and every one of them began to chase away Neopets and destroy the scenery. The Meerca desperately tried to stop. He kept calling for help, but all that he could emit was sharp screeches that only made Neopets even more scared of him. At the same time, the malevolent thoughts seeped in again, telling him to keep going. This being wanted to destroy the Faerie Festival. Why couldn't have the being done that himself. Why did it need Neopets, including the Meerca? It certainly had the magic to change every one of them into wraiths. The next thing the Meerca knew, everything was destroyed. Decorations were torn to bits, food was scattered all over the ground, and there was no living thing, Neopet or faerie, around to be seen. It had all been a blur to the Meerca. He couldn't remember what he was doing other than trying to stop himself and screeching for help. "Good job, my wraiths. Now scatter. I'm sure the faeries will be looking for us. I'll bring you back together if I need you again." As soon as the being said those words, all of the wraith Neopets ran off in different directions. The Meerca was happy to finally get away from it, but he was still a wraith. He wanted to be a Meerca again. He didn't want these evil thoughts to invade his mind or to harm other Neopets. He just wanted to go back home. But you don't want to go home, a voice in the Meerca's head hissed. The Meerca fought to get it out of his head, but the voice lingered. Wraith instincts were starting to kick in. No matter what the Meerca tried, he couldn't seem to get a hold of himself. He tried to fight the wraith side of him, but to no avail. Eventually, in utter defeat, the Meerca let the wraith side do what it wanted. It began to walk around in search of other Neopets. The Meerca could only watched as the wraith did so, taking his body along for the ride. The wraith found a Neopet after some searching. It was a dimensional Kyrii. The Kyrii appeared to have some battling equipment on her. The wraith looked at her suspiciously, wondering why she had weapons on her. She looked over at the wraith and her eyes widened. Both the wraith and the Meerca now learned the reason the Kyrii had weapons on her - she had come to fight them. The wraith eagerly charged at the Kyrii and began to battle. The Meerca grew worried about himself and the Kyrii. He didn't want to get hurt, but he also didn't want to fight the Kyrii. The Kyrii appeared to fight the wraith with ease. The Meerca saw that she had been in training. The wraith did its best to win, but it quickly realized it had no chance. It didn't take too long until the wraith was defeated by the Kyrii. When the wraith was defeated, the Meerca felt the wraith energy separate from his body. He looked down at his arms to see the energy melt away, leaving only his yellow arms. Soon, all the energy was a puddle on the ground, only leaving the Meerca. However, it soon began to bubble back up under his feet. The Meerca began to run, but the energy latched back onto its tail and crept up onto his body. "Help," the Meerca cried to the Kyrii. All the Kyrii do in response was stare at him in horror. The wraith had taken over the Meerca again. It felt completely refreshed and ready for battle, as if the fight between it and the Kyrii never existed. He began trying to beg for help again, but all he could do was screech like what he did at the Faerie Festival. The Kyrii readied her weapons again and began to fight the wraith again. The Meerca was hoping and pleading for the Kryii to win. Maybe if she fought the wraith enough, it would separate from him permanently. He didn't want to fight Neopets. He didn't want to cause harm. He just wanted to go home! But all the Meerca did was watch as the wraith part of him fought and fought and fought. He had long since given up fighting the wraith. Now the only thing left for him to do was hope that the wraith from him would be removed for good.